Dave loathes the tourist trail. The things that most people queue up for - he shuns - until we discovered his love for visiting ruins. Fortunately for us, Turkey has an enormous number of ancient ruins from the Lycians, Greeks, Romans and others. It is a country almost hiding its historical and mythical roots from the average person. Unless you are a history teacher or a history buff, I am going to guess you will find these things as surprising as we did. Did you know that the city of Troy, which served as the setting for most of the ancient Trojan War, is actually in present-day Turkey? (I always assumed it was in Greece)! Heard of that guy Saint Nick? You know, the one who will delight children everywhere in about a month? He's from Turkey too. As a 4th century Saint and Bishop in a town in the Turkish Lycian area, he was noted for his secret gift giving and eventually became the model for our present day Santa Claus. Remember Mary? The mother of Jesus? It is said she likely lived her last days out on the coast of Turkey, near the current city of Selcuk. It is assumed she was brought to the area with St. John, who had promised Jesus he would look after her following his death. And John? He was ultimately banished from the area and retired to the island of Patmos to write the Book of Revelations. Greek mythology runs deep throughout the region and we got up close and personal with it while sitting near the fires of Chimera, a creature with a lion front, a snake behind and goat in the middle. Chimera was fire-breathing and ultimately defeated by Bellerophon and Pegasus at the request of the King of Lycia. Her fire supposedly seeped into the ground where she was slain, which helps to explain the gas vents emitting fire on the hillside of an ancient Lyican area near the town of Cirali on the southern Turkish coast. Dave sitting among the eternal flames of Chimera in southern Turkey. None of this is really surprising when you discover (or remember from history class) that Turkey was conquered by the Romans in the later B.C. years. Greeks also had their share of claim over the land, all which resulted in numerous ancient cities lining the country. The small ancient town of Olympos, sitting back along a river running out to the the Mediterranean Sea, was a short walk down the beach from our base of Cirali. You can tell why people would have wanted to live there. Mountain views, trees lining the walkways and the fresh ocean air. It is said that Julius Caesar helped conquer the city, adding it to the Roman empire. The beautiful setting and backdrop of the ancient town of Olympos, Turkey. The ruins of Olympos are a little overrun by nature, with trees climbing the walls and plants coming through the stones. It reminded me a little of the temples in Angkor Wat that have been taken over by its neighboring jungle. Given the state of "ruins" at Olympos, the most impressive site is the front wall of the temple supposedly built for the emperor Marcus Aurelius. The door to the temple leads to more ruins, but it lets your imagination run wild with what the completed temple may have looked like. The huge door to Marcus's temple in Olympos. By far, the most impressive set of ruins we saw was in Ephesus. Ephesus, or Efes in Turkish (Efes is also the national beer of Turkey), was a magnificent ancient town that is only partially excavated (they say far less than half of the city has been uncovered). I can't imagine what they will continue to find in the next century. The ruins of Ephesus also sit among mountains and near the sea. Its grandeur and size eludes to a city that was teeming with activity and community. Legend says that people like Julius Caeser, Cleopatra, St. John and St. Paul all walked its streets. Looking down Curetes Street toward the Library of Celcus. The Library of Celcus, one of the most remarkable sites in Ephesus. The great theater in Ephesus. One of the more incredible sites in Ephesus is the Terrace Houses where some of the wealthy lived in Ephesus. There is a major project being undertaken in one set of the houses to "put some of the pieces back together." 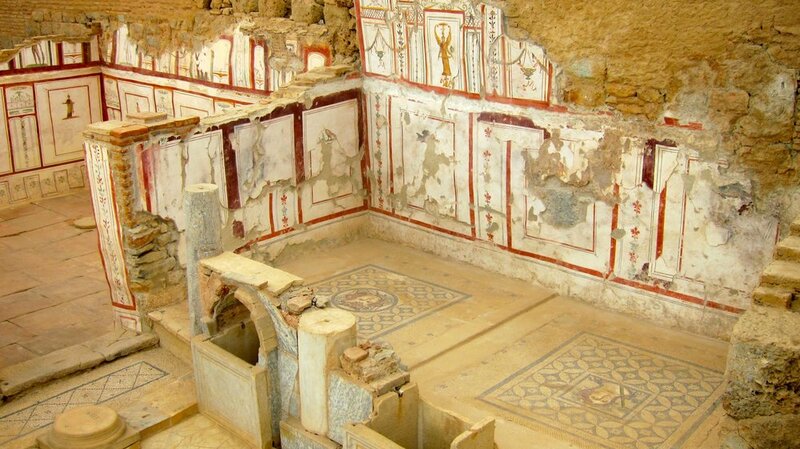 The floor mosaics, wall paintings and marble furnishings - many from the first century - are still visible. It was amazing to see such relics of living history. Starting to put the terrace houses back together. Some original wall paintings and floor mosaics in the terrace houses. Exploring these areas really had me wishing I paid more attention in history class - or maybe we didn't learn a lot about it? I don't know which it was, but if I had children, I would be taking them on a trip here immediately to see what some pieces of history really look like. We just scratched the surface of the ancient cities in Turkey, there is so much more to see. -Ephesus is walking distance from the town of Selcuk. Base yourself in this little town with plenty of accommodation and food options. We walked from town to Ephesus on a wide walking path in less than an hour. -You can get to Selcuk from Izmir. If you fly from Istanbul, take either AtlasJet or OnuAir, which operate free shuttles from Izmir's airport to the town of Selcuk. They are discount airlines with this incredible free service! -To avoid paying for a guide in Ephesus, download the Rick Steve's audio tours app if you have an iPhone. You can listen to the free walking tour as you explore the ancient city. -Olympos is a 3 km walk down the beach from the peaceful oasis town of Cirali. Highly recommend basing yourself in Cirali at one of the many pensions and taking the walk down the beach one day to explore Olympos. You can also walk to Chimera from Cirali.